With new year’s resolutions and Operation transformation fever about to take Ireland by storm in a storm once again, when thousands of participants across Ireland will be getting involved in many activities over the course of the programme, road safety professionals advise is been issued to its participants. People are reminded dark coloured clothing and coats may look chic, but at night or on cloudy days, they can make pedestrians almost invisible. Every year in Ireland, the majority of pedestrian fatalities occur at night or in low-light hours, with a total of 41 pedestrians and nine cyclists in 2018. Gardai in Mayo have stocked all their patrol cars with Hi Viz to hand out to road users who have none and are on the roads in poor visibility. Improving visibility means improving safety. 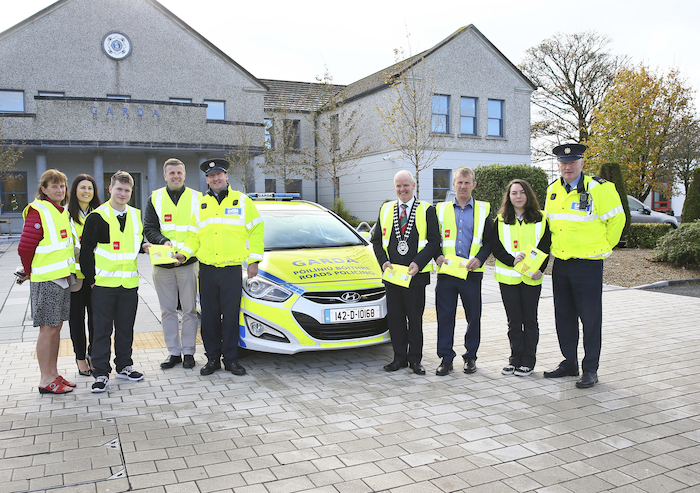 That’s why the road safety Department of Mayo County Council are urging pedestrians to 'See and be Seen' this New Year. Wearing light colours or reflective clothing is one of the simplest things pedestrians can do to keep themselves safe, and Mayo County Council is asking the public to dig out the Hi Viz vest lying around the house, dust them down and use them. Pedestrians are also encouraged to follow these safety tips: (1 ) Pretend you're invisible. Don’t assume a driver sees you. In fact, imagine that a driver can’t see you, and behave accordingly; (2 ) Plan your walk – location where little or no traffic; (3 ) Wear bright or reflective clothing or shoes when walking at night. Avoid dark clothes; drivers can't avoid what they can't see; (4 ) Stay sober; walking while impaired increases your chance of being struck; (5 ) Unplug your ears. Avoid using or wearing headphones—you need to be able to hear approaching vehicles. If you do use headphones, run with the volume low and just one earbud in. Don't wear headphones or talk on a mobile phone while crossing the street; (6 )Watch out for motorists’ blind spots. Watch the hills. When they crest hills, drivers' vision can suddenly be impaired by factors like sun glare or backdrops Remain alert! Don't assume that cars are going to stop; (7 ) Be aware of vehicles around you. Make eye contact with motorists before crossing paths. Watch for early birds and night owls. At odd hours be extra careful. Early in the morning and very late at night, people may be overtired and not as attentive; (8 ) Use footpaths whenever possible; (9 ) Look left, right and left again before crossing. Watch for turning cars and (10 ) Check with your local sports partnership for official walks. Motorists are also encouraged to follow these safety tips: (1 ) Watch for pedestrians especially at night and early morning; (2 ) Expect and slow for pedestrians in popular walking areas and (3 ) Drive at cautious speeds in rainy weather and in low-light areas. Noel Gibbons Road Safety Officer said: "It is crucial when using the road at night-time that you are seen. As always, we urge people to wear high-visibility vests, reflective bands, and carry a light." Page generated in 0.1552 seconds.